Review: Waves, poisonous animals, and an au pair that can fly a jet over an ocean. That is a couple days in the life of siblings Amy and Dan Cahill. 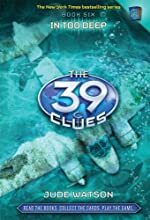 The 39 Clues series is written by numerous authors such as Jude Watson, Rick Riordan, Gordon Korman, Peter Lerangis, and Patrick Carman. In the 6th book in the series, In Too Deep by Jude Watson, 14 year old Amy Cahill and her 11 year old brother Dan are in a kind of extreme scavenger hunt for 39 clues to become the most powerful people in the world. This series has bombs, secret bases, and traitors at every turn. In In too Deep Amy and Dan are going to Australia because they found their parents’ passports with the most recent location being Australia. There they hook up with their surfer-dude cousin Shep. He takes them to the beach where they get ambushed by the Holts, Amy and Dan’s ripped cousins. Later on Amy gets tricked onto the Kabra’s boat. The Kabras are like perfect little English children, but their mom threatens Amy to either give her all the clues she has, or get thrown into shark water. Amy escapes and she gets Shep to fly everyone to a place in the outback. There they explore tunnels, and then the Kabra’s mom drops lots and lots of poisonous animals. They escape by busting a hole in the wall. Then they go to investigate a supposed lab on Krakatau’s island where they find their uncle Alistar and a base/condo. Amy and Dan wake up in the middle of the night to a fire. Irina Spasky, Amy and Dan’s evil assassin relative, saves them but dies in the fire. Overall I would give this book 5 out of 5 stars. Positives would be the suspense, surprises, and action. Amy slowly regaining memory of the fire that killed their parents really added to the suspense. I was really surprised when Amy and Dan found out their au pair Nellie could fly a jet. There really weren’t many negatives except one of the main rivals dies. I would recommend this book to people who like paradise with a hint of action. We would like to thank Scholastic for providing a copy of Book 6: In Too Deep for this review. Have you read Book 6: In Too Deep? How would you rate it? I think this series has a great premise: an international scavenger hunt with elements of suspense and intrigue. I'm glad to read in your review that the series is still strong after 6 books.